The Business Outsourcing Company is a division of CNG Business Services, which is part of the privately owned CNG Family of Companies. Our group was founded in 1971 and now has business services, retail and real estate interests both within the UK and overseas. We provide a wide range of Business Process Outsourcing services from our main outsourcing office located in Mumbai, India. We have a broad talent pool and our staff members possess numerous different skill sets. We are thus positioned to serve all clients, both large and small, in a bespoke yet flexible fashion. We treat every customer as an individual. There is no standard outsourcing service which is suitable for multiple clients, rather every client has its own ways of doing business and we are here to see how we can improve efficiency. We spend time understanding each clientâ€™s unique operational processes and their needs so we can propose bespoke solutions that add the most value. We understand the efficiency gains from outsourcing. After all, we set Business Outsourcing Company up only after realizing the benefits our own organization enjoyed from having an overseas back-office. We decided to share our office staff with other clients, and we have just kept on growing after that. Come to us and we will help you to grow faster. We feel that all companies, not just the largest, should have access to the efficiency gains from working with a professional business process outsourcing provider. We are delighted to work with all sizes of clients and to help accelerate their growth prospects. We are delighted to be working with an ever growing list of clients. This validates the value proposition that we provide. The Business Outsourcing Company is better than the other outsourcing providers we’ve considered in the past. They give our company a flexible, easy and cost-effective resource that complements our existing sales team. They not only deliver real results – they help strengthen our bottom line. We’re looking forward to working with them on even more projects – which we believe says it all. Our success with Cheque Exchange is also credit to their own business acumen and tremendous drive. Weâ€™re grateful to them for embracing our tailored approach to outsourcing, which has strengthened their sales, streamlined their back office process and helped drive the bottom line. Outsourcing does not just save cost. The key reason [for it] is flexibility, both in terms of pricing and speed of change. [Outsourcing] has led to nimble organisations operating within tight domestic headcounts and punching above their weight. 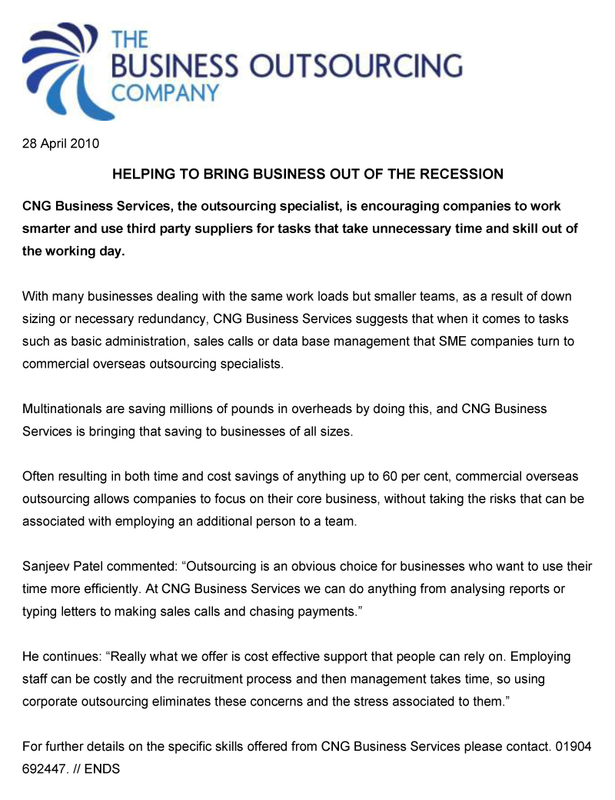 For savvy SMEs, there are an increasing number of ways to outsource business processes and survive a tough economy. Shrewd businesses outsource several elements of their processes, thereby concentrating on whatever they do best. Around 80% to 90% of our calls are in English, but [with those retails for whom English is a second language] even an initial greeting in [their] language can build rapport and we can assist if someone is stumbling on a word. We provide [culturally sensitive] knowledge [for our clients]. Knowing a religious calendar [for example] is a way of building a closer relationship between retailers and our clients. We can arrange promotions to suit festivals such as Eid or Diwali. Around 80% to 90% of our calls [to retailers] are in English, but even an initial greeting in another language [to those for whom English is a second language] can build rapport and we can assist if someone is stumbling on a word. Cultural and linguistic diversities can make business negotiations, selling and marketing within the retail industry more difficult than it needs to be. As a multilingual team we can speak to businesses direct and treat them as individuals. We are also very aware of ethnic and cultural sensitivities and are able to advise a client about how best to approach another company, who may not have the same principles or beliefs. In our experience brands that take the time to understand the cultural preferences of their prospects are far more likely to improve sales compared with those who consider a mass market approach. 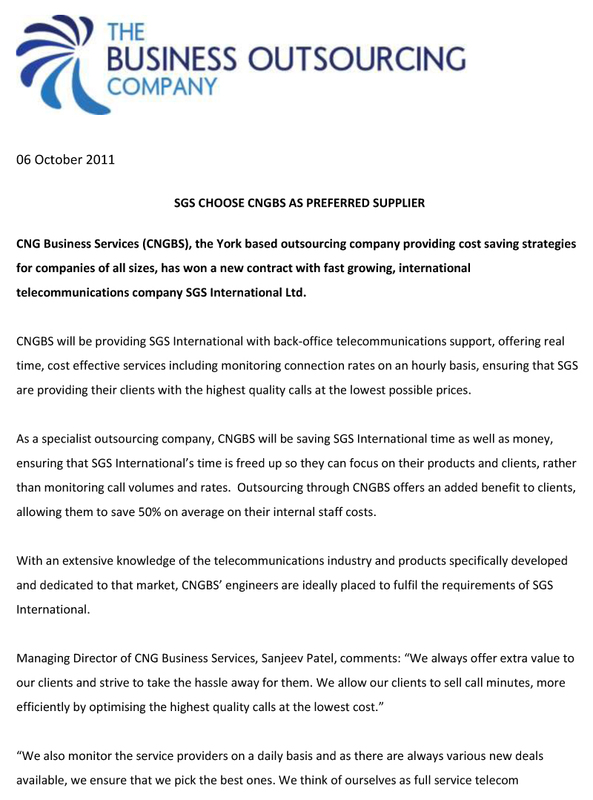 As our company continues to expand and thrive, we are pleased to outsource our back-office activity to CNGBS which will help save us time and money, allowing us to provide the best possible service to our customers. We always offer extra value to our clients and strive to take the hassle away for them. We allow our clients to sell call minutes, more efficiently by optimising the highest quality calls at the lowest cost.. We also monitor the service providers on a daily basis and as there are always various new deals available, we ensure that we pick the best ones. We think of ourselves as full service telecom outsourcing specialists offering 24/7 business solutions tailored to each aspect of our clients’ business models. We’re really excited to begin our partnership with a fast-paced and dynamic company like SGS International and look forward to helping them continue to develop and grow. The telecommunications market is a growing industry sector. We identified that there were opportunities to provide services 24 hours a day, seven days a week, to those businesses who want to work more efficiently and provide a quality service for their customers while maintaining a commercially viable operation. Significant cost savings can be achieved as a result of offshore support. Data capture, inputting, finances and back office support are all services that can be handed to an offshore outsourcing team with no negative impact on the business. 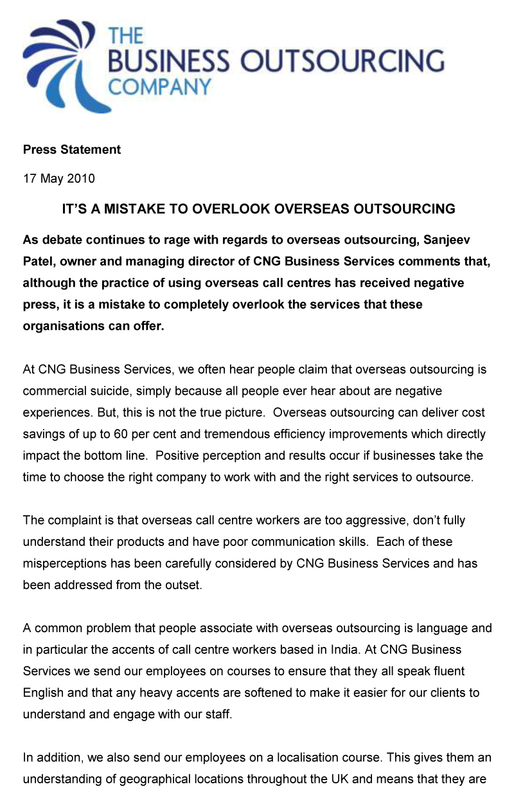 We often hear people claim that overseas outsourcing is commercial suicide, simply because all people ever hear about are negative experiences. But, this is not the true picture. Overseas outsourcing can deliver cost savings of up to 60 per cent and tremendous efficiency improvements which directly impact the bottom line. Positive perception and results occur if businesses take the time to choose the right company to work with and the right services to outsource. During difficult economic times, businesses have had to downsize and in many instances make redundancies, leaving gaps within the skill set of their organisation. This is where we are able to help, as we can support the business function with administrative tasks, out of hours support, invoice processing, telemarketing and software development. Despite the fact that overseas outsourcing is often viewed negatively, some companies have been relying on the process for years and as a result are able to save money and do what they do best – focus on the customer and developing their business. 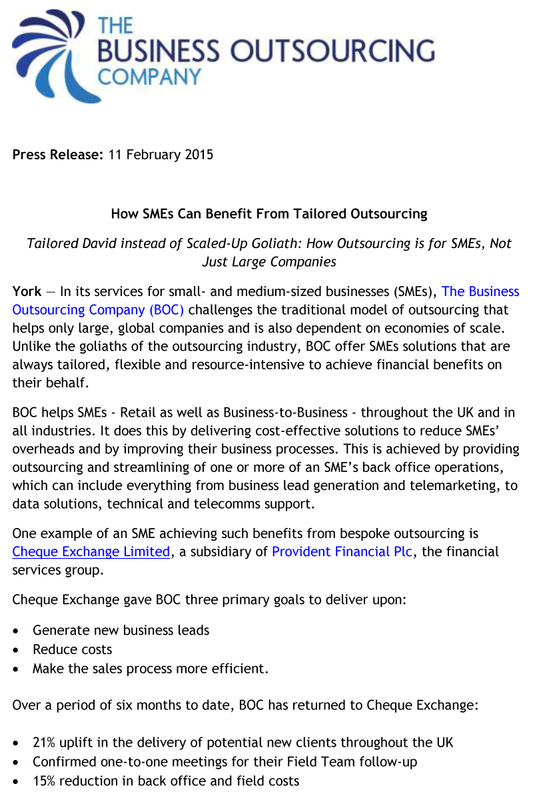 York - In its services for small- and medium-sized businesses (SMEs), The Business Outsourcing Company (BOC) (http://bit.ly/1yZRwuZ) challenges the traditional model of outsourcing that helps only large, global companies and is also dependent on economies of scale. Unlike the goliaths of the outsourcing. 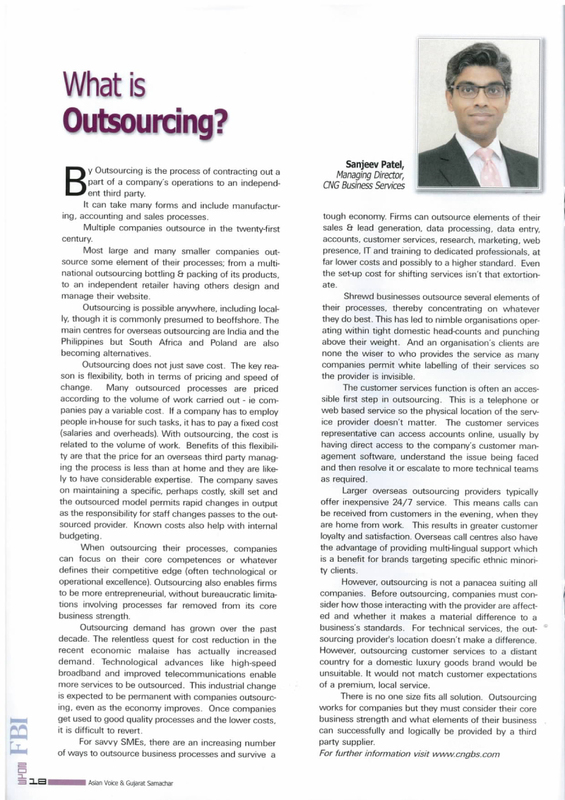 Published Article: What is Outsourcing? With more than 5% of the UK population falling into an ethnicity which is neither white nor black, there is a lucrative and growing market for businesses that have recognised the benefits to appreciating the cultural and linguistic differences of prospective customers. 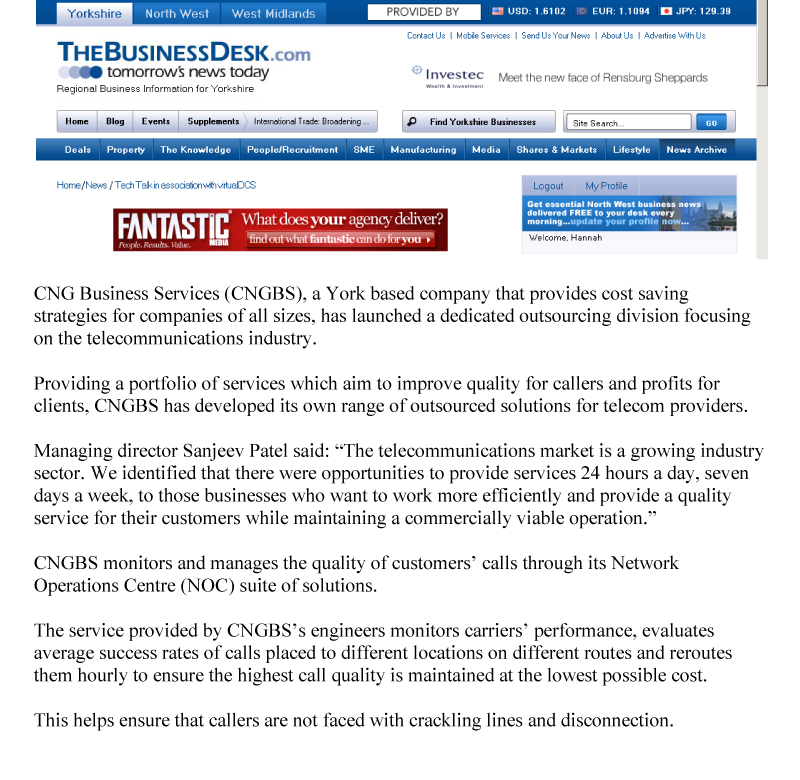 CNG Business Services (CNGBS), the York based outsourcing company providing cost saving strategies for companies of all sizes, has won a new contract with fast growing, international telecommunications company SGS International Ltd.
CNG Business Services (CNGBS), a York based company that provides cost saving strategies for companies of all sizes, has launched a dedicated outsourcing division focusing on the telecommunications industry. 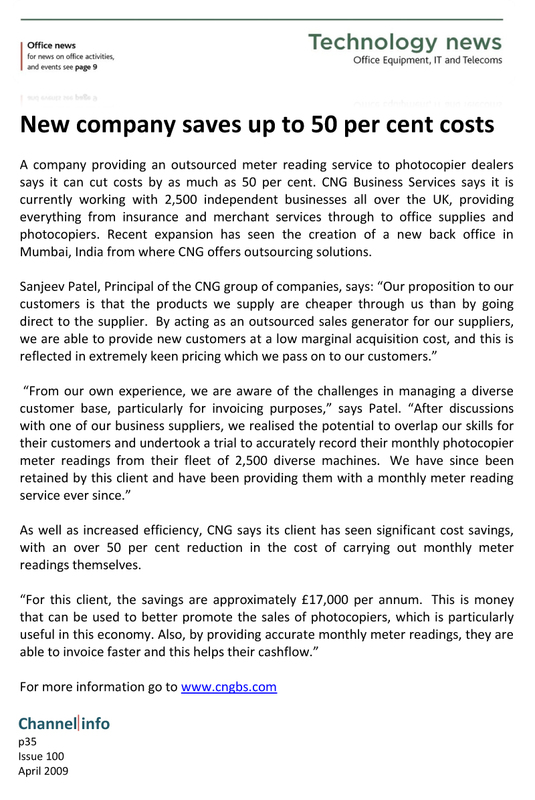 As debate continues to rage with regards to overseas outsourcing, Sanjeev Patel, owner and managing director of CNG Business Services comments that, although the practice of using overseas call centres has received negative press, it is a mistake to completely overlook the services that these organisations can offer. 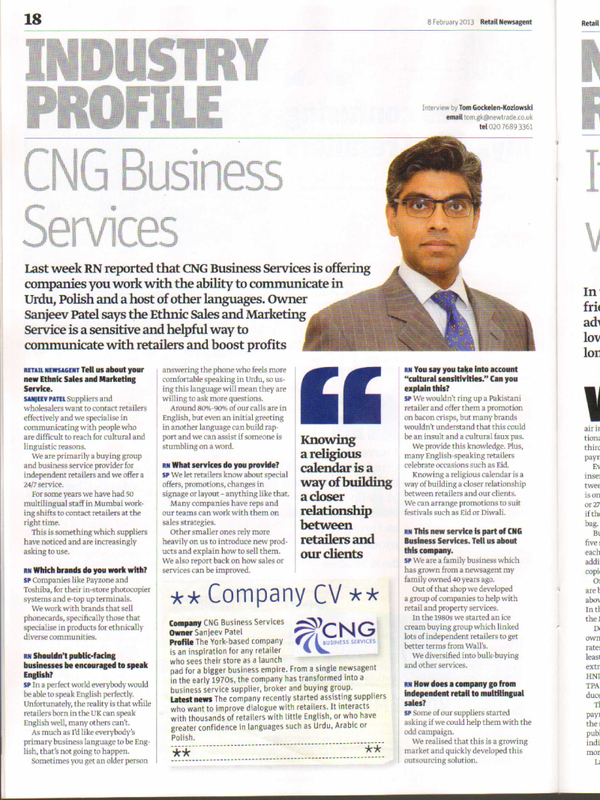 CNG Business Services, the outsourcing specialist, is encouraging companies to work smarter and use third party suppliers for tasks that take unnecessary time and skill out of the working day. 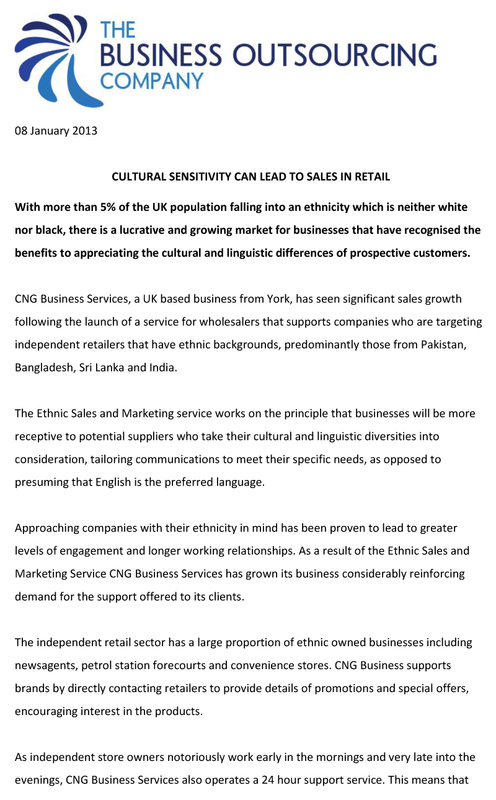 CNG Business Services, the York-based outsourcing specialist, has launched a new ethnic sales and marketing service for its commercial clients. According to CNG the service will take cultural and linguistic diversities into consideration and tailor marketing needs accordingly. Coverage (York Press): What’s in Store for CNG Owner? 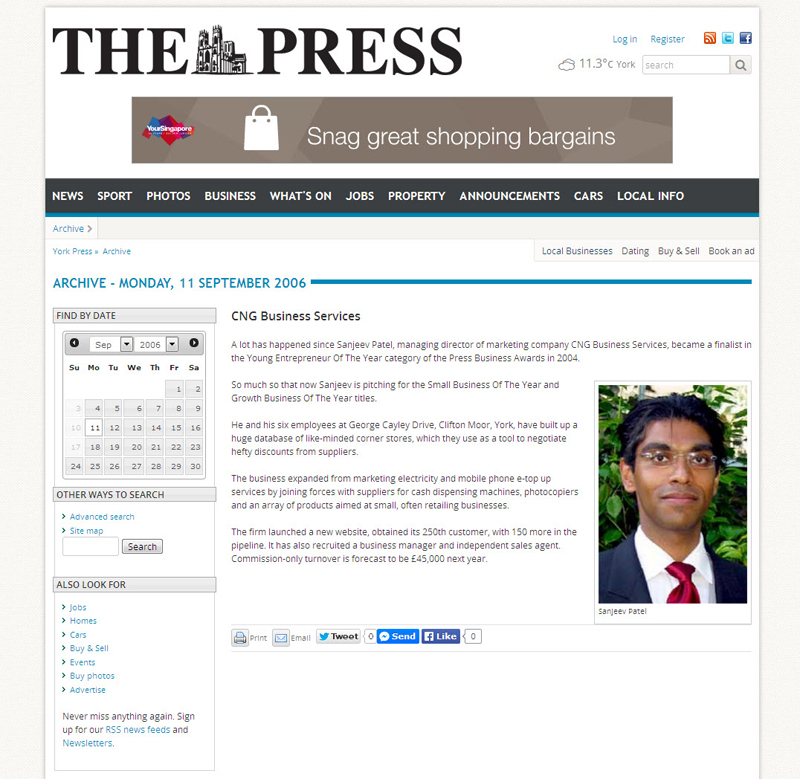 Entrepreneur Of The Year category of the Press Business Awards in 2004. So much so that now Sanjeev is pitching for the Small Business Of The Year and Growth Business Of The Year titles. 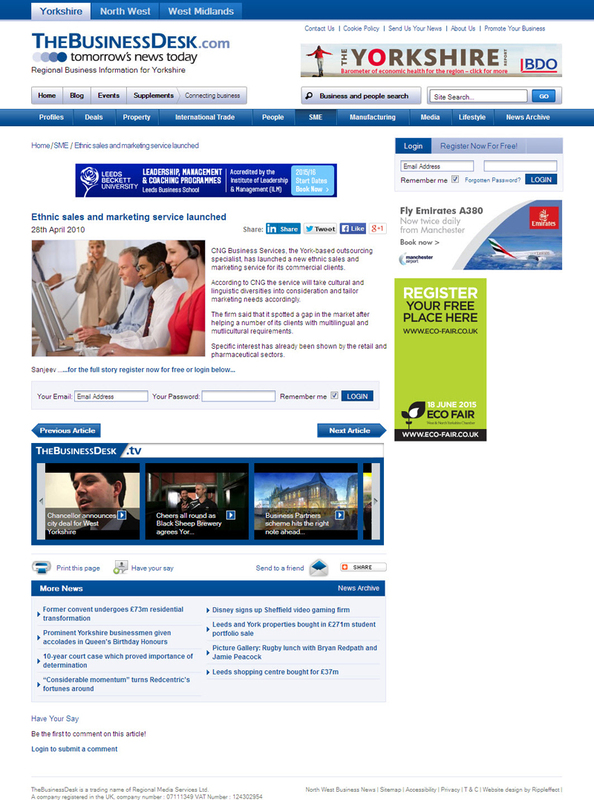 You are subscribing to all news for The Business Outsourcing Company. If you ever need to edit or remove this subscription, just follow the link in the email you will receive when subscribing.